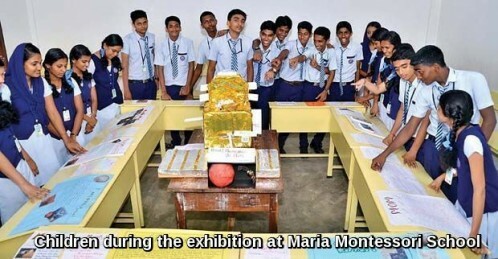 Students of Maria Montessori Central School, Ambalappuzha, celebrated Mangalyaan's entry into the Mars orbit by organising a mini exhibition. They devoted an entire day last week to discussions on Mars, satellites of different countries orbiting Mars and the trajectory of Mangalyaan. A Quiz Competition was also held as part of the exhibition. Vijayasree, Vice Principal, made arrangements to present the ideas of students at the function and show them the functioning and significance of Mangalyaan. The students went into celebratory mode and made a replica of Mars with orange candies. And it was given a standing ovation. “The students are immensely proud of ISRO’s achievement. They say the scientists behind the mission must be given due respect. The exhibition has helped them understand the role of satellites and the importance of exploring space”, said the Vice Principal. Anjana Kiran, who was part of the celebrations said: “We have made a replica of Mangalyaan as a mark of respect to the country’s historic achievement. I would like to be a scientist. We would not have achieved this great success without them”. The main attraction of the programme was the informative posters designed by the students. They were created as per the independent ideas of students who took part in the exhibition. Geethu Krishna, another student said the posters were made to make people understand our Mars mission and how India had achieved this feat in its first attempt and at one-tenth the cost shelled out by countries belonging to the space club. MMCS Football team makes us all proud again. MMCS Celebrates 25 years of educating young minds! MMCS brings home the Sahodaya Football Tournament 2016 Trophy for the 3rd consecutive year.